A stent is a tiny tube placed into a hollow structure in your body. This structure can be an artery, a blood vessel, or something such as the tube that carries urine (ureter). The stent holds the structure open. When a stent is placed into the body, the procedure is called stenting. There are different kinds of stents. Most are made of a metal or plastic mesh-like material. However, stent grafts are made of fabric. They are used in larger arteries. A coronary artery stent is a small, self-expanding, metal mesh tube. It is placed inside a coronary artery after balloon angioplasty. This stent prevents the artery from re-closing. A drug-eluting stent is coated with a medicine. This medicine helps further prevent the arteries from re-closing. Like other coronary artery stents, it is left permanently in the artery. 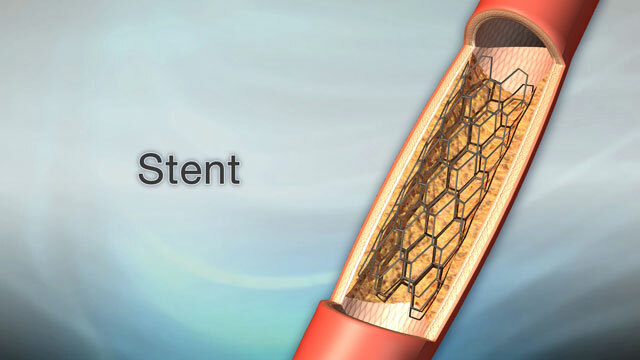 Most of the time, stents are used when arteries become narrow or blocked. Teirstein PS, Lytle BW. Interventional and surgical treatment of coronary artery disease. In: Goldman L, Schafer AI, eds. Goldman's Cecil Medicine. 25th ed. Philadelphia, PA: Elsevier Saunders; 2016:chap 74. White CJ. Atherosclerotic peripheral arterial disease. In: Goldman L, Schafer AI, eds. Goldman's Cecil Medicine. 25th ed. Philadelphia, PA: Elsevier Saunders; 2016:chap 79. Zeidel ML. Obstructive uropathy. In: Goldman L, Schafer AI, eds. Goldman's Cecil Medicine. 25th ed. Philadelphia, PA: Elsevier Saunders; 2016:chap 123.